When Inglis was built in the late 1920s, plans were in place for a fountain as a focal point in the middle of its two-acre interior courtyard. Now, more than 85 years later, construction is underway! 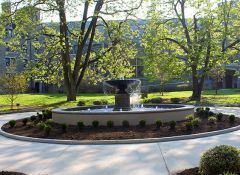 The Courtyard Revitalization project is much more than building a fountain. The courtyard is already an outdoor “living room” for the Inglis Community, filled with mature trees, paved pathways, raised garden beds of fresh herbs, vegetables and beautiful flowers. Besides the fountain, plans call for upgrading the popular outdoor barbeque area with more tables and umbrellas for outdoor seating, adding additional concrete pads by park benches throughout the area so residents and visitors can enjoy each other’s company and building more raised gardening boxes so residents can be more involved in planting and cultivating. The Courtyard Revitalization project is made possible by the sponsors of the 2012 Inglis Golf Outing, area garden clubs and many generous donors.